Stills was a runner-up to Philadelphia’s Chris Long for the NFL’s Walter Payton Man of the Year Award. Long won $250,000 for his favorite charity, and the 31 runners-up, one from each team, received $50,000. Stills is a big admirer of Kaepernick who started the anthem-kneeling movement in 2016. While Kaepernick has been out of the league the last two years, Stills, and a few other players, have continued his anthem-kneeling movement. The anthem-kneeling movement was started by Kaepernick, a former San Francisco 49er QB, to protest police brutality and racial inequality. 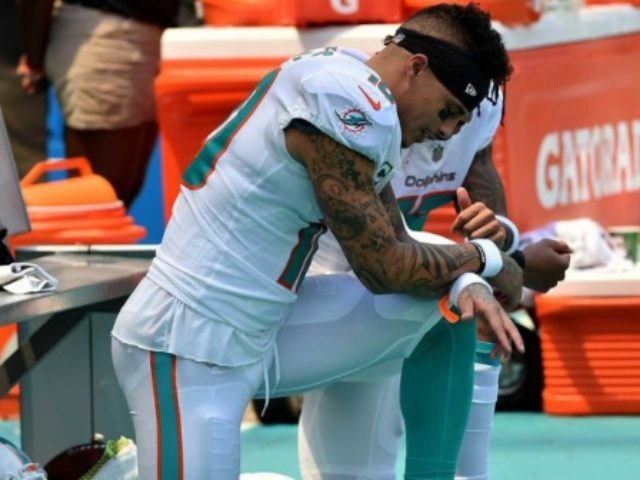 Players participation in the protest movement dwindled this year, but Stills, and teammate Albert Wilson, continued to support the cause and knelt during the anthem prior to 2018 Dolphins games. Wilson’s season ended on October 24 due to a hip injury, so Stills was the Dolphins lone kneeler the rest of the season. Teammate Robert Quinn raised his fist during the anthem. Stills hopes his $50,000 donation can help this initiative. Still also told the AP “it’s frustrating” Kaepernick has been out of the league the last two years. Kaepernick is claiming that NFL owners have colluded to keep him out out of work, but Denver Broncos VP John Elway said he offered him a contract, but he turned it down. While Kaepernick has been out of the league, he’s been a vocal critic of the NFL, and praised singer Rihanna for turning down a chance to perform at the latest Super Bowl. And Kaepernick also appreciates Stills continued support.